Who am I trying to kid? Stress kills, we all know it. Heart disease and addictions and insomnia – with results like these, it’s not sounding all that healthy now, is it? Zero in on this: When managed properly, pressure makes us produce. Whether the squeeze is a quota to meet at work, a relationship to mend or a temptation to whip, the expectation that we will do well increases the likelihood that we will do well. It’s in the nature of most of us to want to succeed at the things we try. Those who avoid pressure in all forms are trapped in a rut of intimidation. We need a little pressure to squeeze us out of these ruts. There are some keys to keeping pressure healthy and to managing the amount of stress that works for our good. Know how much is enough. You have to be aware of your trigger points. What are the signs that it is getting to you? Just this side of that, back off. Be in control of it. Never let the pressure control your life. You call the shots, you be the boss of the pressure, not the other way around. Take a break. Even non-geniuses know you need to vacate sometimes. A daily 20-minute power nap may do the trick or you might need a cruise from time to time. All work and no play makes Jack act like an idiot. Share the load. One guy can do the work of two but two can do the work of five. Synergy is the principle at work here. Learn the skill of teaming up. The pressure sinks and the productivity skyrockets. Measure the results. Note where you are now and note where you are after an especially pressure-filled season. You should be markedly ahead. If not, either the pressure managed you or it was unnecessary pressure in the first place. 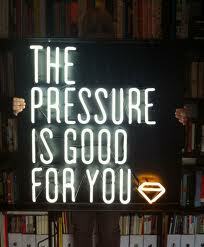 Come on and admit it – the pressure brings out the best in you (if you don’t let it kill you first! ).